Manatee mother and calf are seemingly entwined in strong warming Florida sun rays. The bond is tight between the mom and her baby for nearly two years. They navigate around the springs near the submerged cypress tree roots in the crystal clear water at Three Sisters Springs, Crystal River National Wildlife Refuge, Kings Bay, Crystal River, Citrus County, Florida USA. 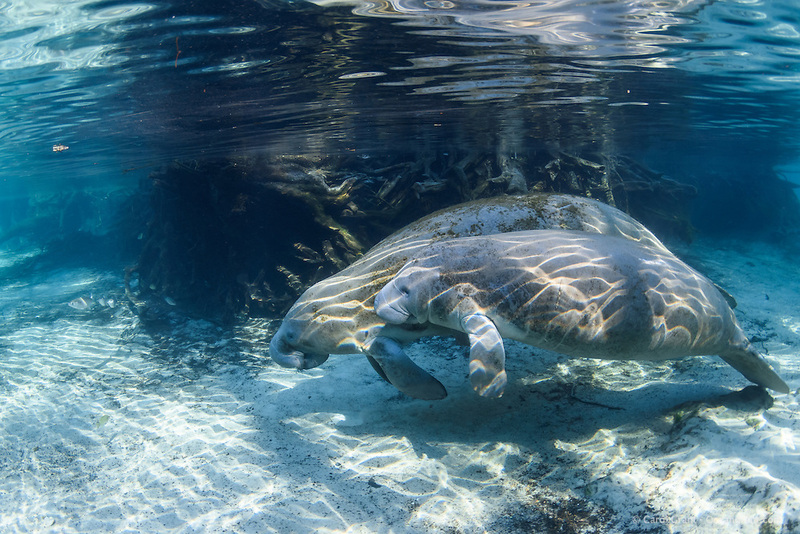 Florida manatee, Trichechus manatus latirostris, a subspecies of the West Indian manatee, IUCN Endangered but proposed downlisting to Threatened by USFWS for 2017: http://www.iucnredlist.org/details/22106/0. Nikon d7200 1/80 f8 Tokina 10-17 at 15mm ISO 400 Subal Underwater Housing, Subal 8" dome port, natural light. Post-processing is normal listed actions.